You are currently browsing articles tagged ShaderX. 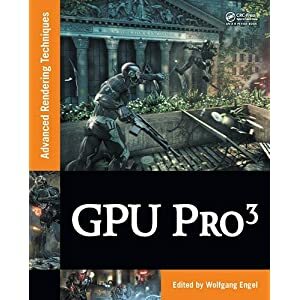 Like the title says, GPU Pro3, the next installment of the GPU Pro series, is now available for order. The publication date is realsoonnow (January 17th). The extended table of contents is a great way to get a sense of what it contains. The GPU Pro series is essentially a continuation of the ShaderX series, just with a different publisher. I was given a look at the draft of this latest volume, and it appears in line with the others: some eminently practical and battle-tested approaches mixed with some pie-in-the-sky out-of-the-box done-with-the-metaphors ideas – having a mix keeps things lively. Articles such as the one covering the CryENGINE 3 is a fine combination of both, with solid algorithms alongside “this doesn’t always work but looks great when it does” concepts. Some of the material (including a fair bit of the CryENGINE 3 article) can be gleaned from presentations online from GDC and SIGGRAPH, but here it’s all polished and put in one place. Other articles are entirely fresh and new. Priced reasonably for a full-color book, it’s a volume that most graphics developers will find of interest. After all the heavy lifting Naty’s been doing in covering conferences, I thought I’d make a light posting of fun visual stuff. In short, the ShaderX series has moved publishers, from Charles River Media to A.K. Peters. Unfortunately for everyone else in the world, CRM retains the rights to the ShaderX name, hence the confusing rename. This book is ShaderX8, under a new title. This resource is possibly handy: a map of game studios and educational institutions, searchable by state, city, etc. That said, it’s a bit funky: search by “Massachusetts” and you get a few reasonable hits, plus the Bermuda Triangle. Search on “MA” for State and you get lots of additional hits, mostly mall stores. But, major developers like Harmonix (in Cambridge) don’t show up. So, take it with a grain of salt, but it might be handy in turning up a place or two you might not have found otherwise. See more examples on Peter Selinger’s Potrace examples page. Doubly impressive is that Peter also carefully describes the algorithms used in the process. I enjoy collecting images of reality that look like they have rendering artifacts. Here’s one from photos by Morgan McGuire, from the Seattle public library. The ground shadow look undersampled and banded, like someone was trying to get soft shadows by just adding a bunch of point light sources. What’s great is that reality is allowed to get away with artifacts – if this effect was seen in a synthetic image it would come across as unconvincing. My one non-visual link for this posting is to Jos Stam’s essay on how photography and photorealism is not necessarily the best way to portray reality. There are tons of visual toys on the web, a few in true 3D. Some (sent on by John McCormack) I played with for up to a whole minute or more: ECO ZOO – click on everything and know it’s all 3D, don’t forget to rotate around; the author’s bio and info is at ROXIK – needs more polygons, but click and drag on the face. In the end, give your eyes a rest with this instant screen saver (actually, it’s also a bit interactive). This last was done using Papervision3D, an open source library which controls 3D in Flash. More demos here. Maybe there’s actually something to this idea of 3D on the web after all… nah, crazy dream. OK, I’m done with things that are in some way vaguely, almost educational. Here’s a video, 8 Bit Trip, that’s been making the rounds; a little more info here. Not fantastically entertaining, but I admire the amazing dedication to stop motion animation. 1500 hours?! The Mighty Optical Illusions blog is a great place to get a feed of new illusions. Here are two posts I particularly liked: spinning man (sorry, you’ll actually have to click that link to see it) and more from Kitaoka, e.g. If you hanker for something real and physical after all these, you might consider making a pseudoscope (instructions here). To be honest, I tried, and I’ll tell you that mirrors from the local craft store are truly bad for this project. So, I can’t say I’ve seen the effect desired yet. Next step for me is finding a good, cheap store for front surface mirrors (the link in the article is broken) – if anyone has suggestions, please let me know. With Wolfgang Engel’s blessing, I’ve added the ShaderX2 books’ (both of them) CD-ROM code samples as zip files and put links in the ShaderX guide. The code is hardly bleeding edge at this point, of course, but code doesn’t rot – there are many bits that are still useful. I’ve also folded in most of the code addenda into the distributions themselves. The only exception at this point is Thomas Rued’s stereographic rendering shaders; in reality, more up-to-date information (and SDK) is available from the company he works with, ColorCode 3-D.
Will there be a GPU Gems 4? I don’t know. But I do know there will be a ShaderX^7 and, with your help, a ShaderX^8. The timeline and information about this next volume is at the ShaderX^8 site. If you’re interested in submitting, one detail (currently) missing from this site is that an example ShaderX proposal, writing guidelines, and a FAQ can be downloaded from here. The key bit: proposals are due May 17th. I’m not currently associated with this series (though I was for volumes 3 & 4), I just like to see them get good submissions. The existence of these book series – Game Programming Gems, ShaderX, GPU Gems – is a fascinating phenomenon. Conferences like SIGGRAPH are heavy on theory and cutting-edge research, light on practical advice. Books like ours can be more applied, but are survey-oriented by their nature, not spending a lot of time on any given topic. Code samples and white papers on the web from NVIDIA, AMD/ATI, etc., and independents such as Humus, they’re great stuff, but are produced by particular groups of people with specific interests. Also, sometimes just finding relevant code samples on these sites can be a serious challenge (“search” sometimes works less well than I would like). These book series fill the gap: they go through a review and editing process, improving quality and presentation. This in turn makes them of higher average interest to the reader, vs. a random article on the web of unknown quality. They won’t disappear if someone’s domain expires or interest wanes. They can be easily accessed years later, unlike material published in ephemeral venues such as Game Developer Magazine or GDC proceedings. The titles, at least, can be surveyed in one place by sites such as IntroGameDev (though this one appears to no longer receiving updates, unfortunately, e.g. ShaderX^6 is not listed). The major downside of these books is that they’re only available on paper, not as searchable PDFs (except the first few ShaderX books). Well, almost the entire GPU Gems series is, wonderfully, online for free, but is still not easily searchable. Now if someone could just figure out a Steam-like system that let people buy books in electronic form while protecting publishers’ monetary interests. Hmmm, maybe eye-implanted bar-code readers that check if you have access to a given piece of digital content, that’ll be non-intrusive… Anyway, this is the challenge ahead for publishers. Maybe the Kindle is the best solution, but I like the Steam games model better, where something you’ve purchased is available on any computer attached to the Internet. Best of all for consumers is free & digital, of course, but this does trim back the pool of authors pretty drastically, as a royalty percentage of 0% is not much of an incentive (I’ve been reading too many popularized economics books late, e.g. Naked Economics, so have been thinking more in economics-speak, like “incentives”). We wrote our book for the love of the subject, but I can’t complain about also, to my surprise, earning a bit of money (enough to allow me to, what else, upgrade my computer and graphics card on a regular basis). Enough rambling, but the subject of electronic publication is one that’s been on my mind for a few decades now. I expect a solution from you all by the end of the week, then let’s create a startup and we’ll sell out by next March and make a mint. NVIDIA’s done it again, they’re releasing GPU Gems 3 to the web. It’s being done in the installment plan, I expect so that there’s something to announce every few weeks, which is fine. Eventually the whole book will be available, so much better to have this “section a month” scheme than not at all. NVIDIA’s to be complimented on their progressive attitude. GPU Gems 3 is less than a year and a half old, so could still make a few dollars, but NVIDIA’s goal is to get the information out there. This summer Wolfgang Engel and I tracked down authors of the ShaderX and ShaderX^2 books and secured releases. The ShaderX^2 books quickly found a home at gamedev.net, but Wolfgang had to dig around for the PDF for the first ShaderX book, then find a place to host it, plus the dog ate my homework, etc. Long and short, the original ShaderX book is now free for download here: http://tog.acm.org/resources/shaderx/ – I decided to host it on the ACM TOG site, as it’s a valuable resource, despite its hoary old age. Just ignore the first chunk about using 1.x shaders and enjoy the rest. I do wish the GPU Gems books were available as PDFs (hint, hint, NVIDIA), as they would be much easier to search for those “I know I saw this in one of these books” moments.